The Park Hyatt Siem Reap & LHA Sewing Training School gives young women from poor families the chance to improve their future prospects by learning sewing and other basic life/work skills. Disadvantaged young women are taught sewing, English and basic life skills, to prepare them for brighter futures. Their attendance is made possible by the provision of food and accommodation. At the end of the course, students are given sewing machines, a materials starter pack, and in some cases a micro-loan, so that they can use their new skills to earn a living well into the future. PAGE combats the hardship and discrimination faced by many young girls in Cambodia by giving them everything they need to reach the highest standards of education. The program targets the poorest and most disadvantaged girls in the region who otherwise need to support their families by going to work, often in very exploitative situations, and would drop out of school. It is a complete educational support system, providing room and board to those needing it, educational supplies, and financial support and extra tuition. 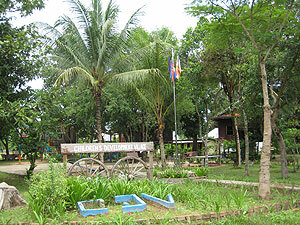 Children’s Development Village is a home for the most poor and disadvantaged Cambodian children in the region. CDV provides up to 40 of the most vulnerable children (including orphans) in Peak Sneng Commune, Angkor Thom District, with the basic needs of housing, food, clothing, healthcare, education and a loving secure environment. 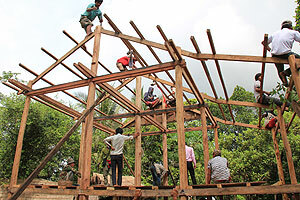 Sustainable Community Project (SCP), formerly known as Food for Education, operates in five villages around Siem Reap. 160 poor families are supplied with rice throughout the year, and on occasion other ingredients such as tins of sardines, bottles of soya sauce and bags of salt. In return the families agree to send their children to their local school. LHA also operates programs for school sponsorship, medical care, health education, income generating activities and home building in these target areas. Peace-house building is included in this project. The Seal of Love Charitable Foundation is at the heart of Wat Damnak and LHA’s core philosophy of delivering lasting and meaningful change to individuals and communities. It provides Scholarships For Monk’s Higher Education through; Monk Leadership Scholarships, Monk Development, Health insurance, Radio Shows, IT Support, and Emergency Aid Fund (e.g. flood, disease outbreak or disaster support).